Even as a child, I enjoyed visiting temples. The prasad was certainly a big draw. I’d stop by random SatyaNarayana Pujas, just to receive of the nectarine prasad. Aarti bhajans were equally soothing. At annual Wadala GSB Ganapati celebrations, while we were enticed by stalls selling bhajiyas and bondas, we first paid our respects to Ganapati, our friend and confidant, with whom we traded future visits for good performance in exams. After decades of taking in the opulence of western cities, I am drawn back to the soothing peace of our humble Devasthans (place of God, temples). During the last several visits to India, we visited numerous temples. Temples near our home in Colaba are the first. A trip to our family deity in Goa: Shanteri Kamakshi Ramnathi Devasthan, Ponda, is a given. We have ooh-ed and aah-ed at exquisite artistry served in devotion to the divine at Badami, and the many beautiful shrines nearby. I remember our enlightening, albeit exhausting walk to the Tirupati Devasthan atop the Tirumala hills. There, I first felt the strong tug of bhakti (incompletely translated as devotion) and it left me shaking for days. That inner consciousness called me on the Kailash Manasarovar Yatra. There I understood how surrender and sacrifice are necessary to sense the divine in our own hearts. That feeling was so overwhelming, I had felt content to exhale my last breath there. And so many more of such holy places to see: Haridwar, Kashi, Rameshwaram, Dwarka, Badri, Kedar, Rishikesh, Puri, Kanchi. So little time. What is it about these Devasthans and holy places that draws me? What is it that draws millions and billions of pilgrims over so many millennia? Certainly, you can visit a temple as a tourist. You may enjoy the physical elements, perhaps take many pics to share on facebook. But you will have missed their biggest attraction – the pervading spirituality. Like if you visited New York City and missed Times Square and Central Park. What then did you really see in New York? The spirituality of the universe remains elusive to many. The only way to experience this spirituality is to travel as a pilgrim. Ignoring the minor irritations of travel, keep your mind focussed on what you seek and journey with bhakti. Devasthans and holy places are sacred, because of the divine presence pervading the elements. It is in such places the unseen energies of the spiritual plane intersects with our mundane physical world. It is here that we can catch a fleeting whiff of spirituality, and experience the enlightening presence of the divine universe. In Hindu scriptures, these places are called tirthas or narrow passages, fords; windows permitting a quick peek into the wondrous world of the divine. Thus the tirth yatra, a journey through these spiritual fjords, is a pilgrimage seeking the divine. The all pervading divine is present here and now, but our material entanglements prevent us from experiencing it easily. Tirthas have an advantage, billions of devotees over millennia have so focussed their energies here that tirthas have transformed into loci of such potent divine presence, they permit even novices like us to sense and revel in the ecstasy. Verily, the divine ecstasy is intoxicating. After decades of marveling at examples of physical conquests in western locales, I now yield to the transcendent joys of visiting our tirthas, hoping to surrender the material. I am not advocating renouncing materialism, but hope to BRING IN the awareness of the all pervading divine to our seemingly limited lives, thus enriching them. 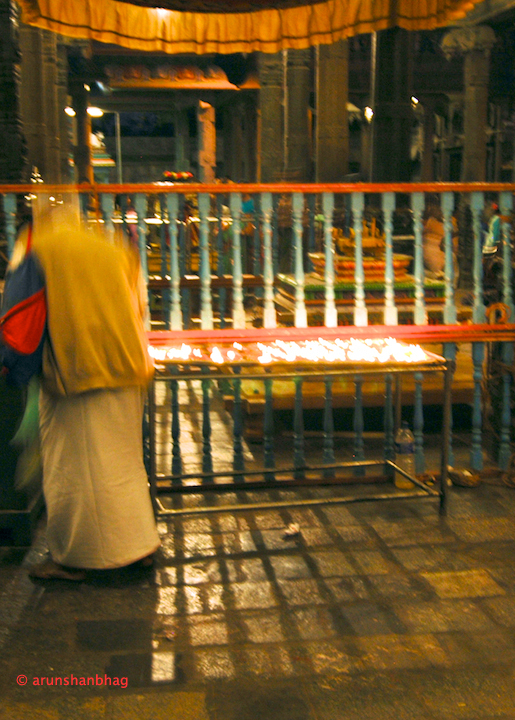 During our last visit to India (Nov-Dec of 2007), my parents joined us for a tirtha yatra to the temples in Tamil Nadu. For 10 days we criss-crossed and soaked ourselves in the magnificent glory of the Tamil. We came face to face with the most opulent of Indian art; we gaped shamelessly at towering gopuras of ancient devasthan (or koyil, as the locals refer to them); we bowed in reverence at the feet of stunningly beautiful murtis, representing livings gods manifested in material forms here on earth. We were awed by the bhakti of 1000’s we encountered along the way; even little girls accompanying their fathers enroute to the Ayyapa Devasthan in Sabarimala, Kerala. What a glorious land this Hindustan! We started our tirtha yatra in Mylapore, Chennai, and our first stop was the Kapaleeshwara Temple (Arulmigu Kapaleeswarar Koyil) at dusk. The opening pic eerily reflects our own inner turmoil at the start of the trip, but is also infused with a soothing calm. What a perfect time and place to make our transition to seeking and sensing the divine. In front of the Devi shrine (karpagambal sanniddhi) we joined devotees lighting tiny oil lamps. From here, we visited the magnificent Parthasarathy Devasthan (Arulmigu Parthasarathy Swamy Temple, Triplicane, Chennai), originally built in the 8th century ce and renovated by the Vijayanagar Kings in the 16th century. It was late in the evening and the temple was nearly empty. We leisurely paid our respects to Shri Krishna the sarathy (charioteer) of Partha (Arjuna) during the Mahabharata war. Importantly, before the start of the war, Shri Krishna offers to all humankind the most beautiful treatise of the Bhagawad Gita. Appropriately, Sri Krishna here sports a moustache. 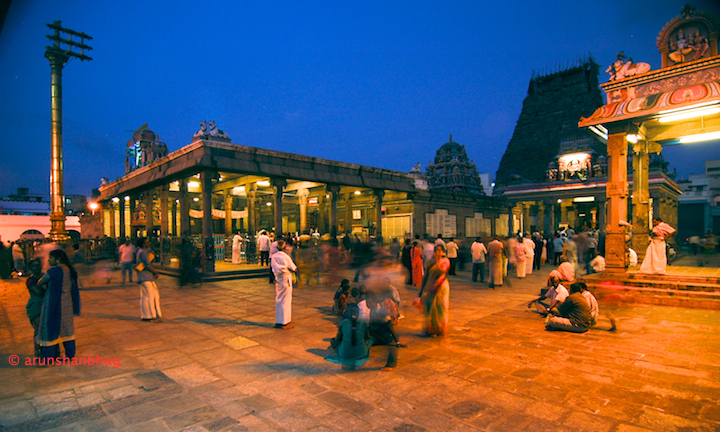 Does the kapaleeswarar Temple comes under tirtha yatra? A Tirth Yatra is simply a journey visiting holy places. glad i did not let you down. This (long) entry took me a while to compose and thus the delay. Having laid the groundwork, the rest should be pretty straight forward – hopefully. Truly, I am ecstatic about visiting temples for all the reasons you mention: great architecture, beauty, and inner peace! Whats not to like. Folks to visit temples a lot more! Thank you for your patience and going through the looong write-up. And yes, the Temple travels were fabulous ~ you gotta do something like this. i have been looking forward to ur articles on temples in TN and u never dissapoint me arun 🙂 it was worth waiting for. On this trip we visited Palani (Pazhani) too! What a fabulous place. We loved it. M and I actually walked up the hilll (700 steps), while my parents took the ‘winch trolley”? Wait till you read about our fabulous experience there. And ofcourse we HAD TO visit Madurai! OMG! What beauty! … and you have been doing this since you were seven? Lucky you! Beautiful! The only two temples I’ve been to in Tamil Nadu are the one in Pazhni and the Meenakshi temple. The former I go to more often because my father is a Muruga bhakta, so I end up visiting the temple whenever I go. I’ve only been to Meenakshi once, and my memory of it is pretty blurred since I think I was around 7 at the time. I like your writing on Bollywood – You are funny! Hope you get to visit the temples and shrines in India. Very beautiful and spiritually elevation. Let me confess, this writing also helps me focus my thoughts and guides me in my own journey. Just wanted to say how much I appreciate your site. (Your book, Prarthana, is excellent also). I tend to write about frivolous subjects, but I appreciate reading about more serious ones, and you have a real knack for describing spiritual things. If I ever get to India (as so many crazy fans of Hindi movies tend to do), I’ll be using your blog for insight into visiting shrines and temples. And since that’s a long way in the future, in the meantime, I really get a sense of “being there.” Thanks again! Yes. Oh yes. beautiful post.